This week's joke to start the week comes not from a member of the Old Jews Telling Jokes crew, but from a member of the audience at the off-Broadway show. 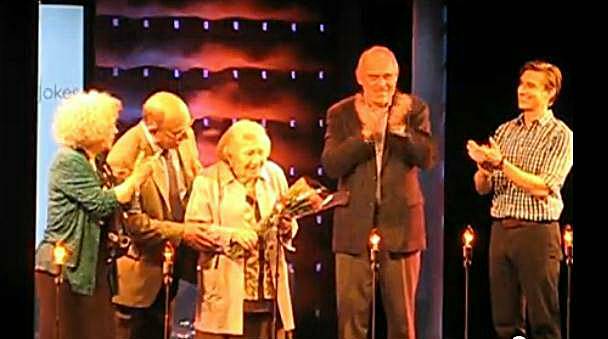 Last month Dorothy Carchman, a 100-year-old great-grandmother, celebrated her birthday with a trip to see the Old Jews Telling Jokes off-Broadway show that has been playing on West 43rd Street in New York for the last year. The cast invited her onstage to play a role in delivering the punch line of a joke that they set up for her. The centenarian got rounds of applause not only for her delivery, but also for telling the audience that she has 6 delicious granddaughters and 13 great-grandchildren. When one of the actors said that he had googled her, she quickly responded "I always wanted to be googled" and got some more laughs. POO..POO..POO! This woman is FABULOUS as are the "hosts".....I hope I'm as frisky and wonderful as she is when I"M 100! HAPPY BIRTHDAY DOROTHY and many many more!! Thanks Al. M.A.